Occupy Wall Street (OWS) was a protest demonstration that took place in lower Manhattan, from September 17 through November 15, 2011. The New York “occupation,” centered on Zuccotti Park, sparked imitator demonstrations by left-wing protesters worldwide. The protest was originally conceived by the staff at the far-left Canadian magazine Adbusters and was promoted by far- and extreme-left activist groups including Anonymous, New Yorkers Against Budget Cuts, and U.S. Day of Rage. The OWS protest was the first occupation-style protest to receive major publicity,  in large part due to media coverage of violent clashes between protesters and New York City police. Due to this widespread publicity, the OWS protest inspired hundreds of occupation-style protests around the world and came to be supported by a number of liberal Democratic politicians,  political organizations, labor unions, and left-wing figures such as Michael Moore and Julian Assange. President Barack Obama extended his implicit support for the protest, while left-wing U.S. Senator Bernie Sanders (I-Vermont) and future U.S. Senator Elizabeth Warren (D-Massachusetts) were ardent supporters. Warren claimed credit for helping to create the protest’s intellectual foundations. OWS failed to devise a singular political mission. OWS co-creator Micah White labeled OWS a “constructive failure” for this reason. OWS has been credited with inspiring the rise of numerous other left-of-center protest movements, including Black Lives Matter, the national anthem protests by NFL players, the left-wing populist presidential campaign of Bernie Sanders, and the Service Employees International Union’s “Fight for $15” campaign. In total there were 2,644 Occupy-related arrests in New York in 2011, which resulted in 409 guilty pleas or convictions. The New York City Police Department was forced to spend $7 million on overtime related to the protests and dozens of workers lost their jobs as a result of local economic disruptions caused by the Occupy protest. 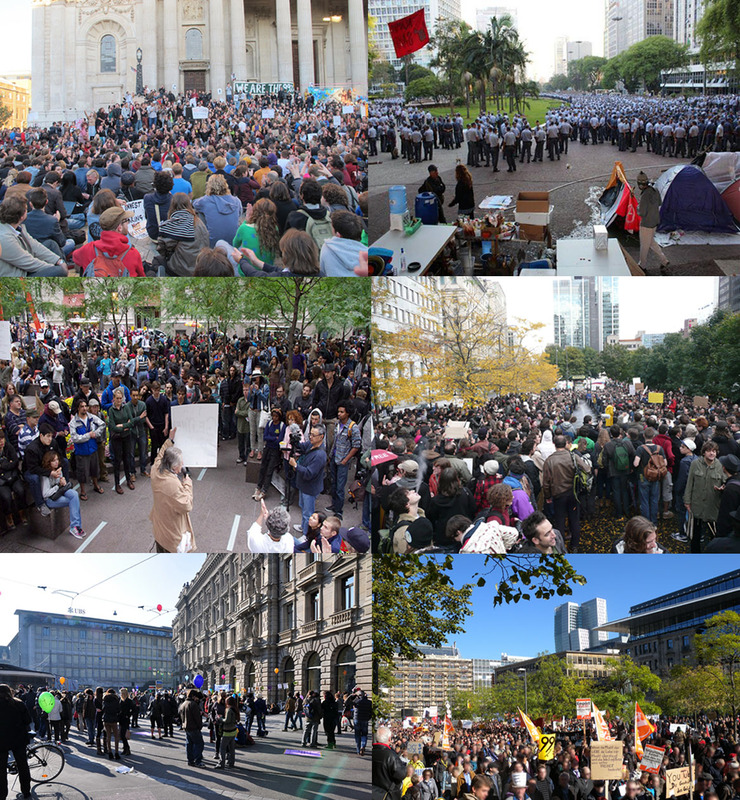 The Occupy protest call to action was supported by a number of radical and left-leaning organizations. The group New Yorkers Against Budget Cuts, which had previously organized a New York occupation-style action, called “Bloombergville,” provided on-the-ground support and organizing. The amorphous “hacktivist” entity known as Anonymous pledged to provide digital support for the effort, amplifying the Adbusters protest call across Twitter, YouTube, and across other digital communication platforms. From September through November 2011 the OWS “occupation” protest was marked by numerous highly publicized events, violent clashes with New York City police, thousands of arrests, union-supported mass actions, and political clashes with New York City Mayor Michael Bloomberg (I). September 17, 2011: About 700 protesters march to Zuccotti Park, a privately owned park on Liberty Street in lower Manhattan, and set up an encampment. September 24: About 80 protestors are arrested for charges including disorderly conduct and resisting arrest. At least one demonstrator was charged with assaulting a police officer. September 25: Anonymous uploads a video around 4:30 pm on this day, threatening the New York City Police Department on behalf of the OWS protesters. September 28: The Transport Workers Union of America (TWU) Local 100 becomes the first labor union to officially support OWS. October 5: A large crowd estimated as containing 5,000 to 20,000 demonstrators march toward New York City Hall. At least 39 labor unions and activist groups including org, the Coalition for the Homeless, the United Federation Teachers (UFT), United Auto Workers (UAW), United Healthcare Workers (UHW) and Public Employees Union DC37 join the march. October 16: President Barack Obama issues a statement saying Obama is fighting for the “interests of 99 percent of Americans,” echoing an OWS talking point. November 15: Mayor Michael Bloomberg orders the removal of protesters from Zuccotti Park for cleaning, citing intolerable “health and safety conditions” and that “the protesters were encroaching on the rights of the park’s owners.” Police arrested nearly 200 individuals during the eviction process. A judge sided with the Mayor, finding that that the park’s owner should be able to keep the park “hygienic, safe, and lawful” despite the protesters’ free-speech objections. In total there were 2,644 Occupy-related arrests in New York in 2011, which resulted in 409 guilty pleas or convictions. Conversely, the city paid $1.5 million to settle 80 lawsuits. Additionally, the New York City Police Department spent $7 million in overtime related to the protests while the city was already facing a $2 billion budget deficit. Meanwhile, local New York businesses were forced to fire dozens of employees as a direct result of the Occupy protest. The OWS protests in New York were the first Occupy-styled protest to gain widespread attention and served as the inspiration for hundreds of similar protests in cites in America and around the world. As of November 11, 2014 the Guardian listed at least 750 verified Occupy Movement events that were in part inspired by the Occupy Wall Street protest. OWS’s slogan, “We are the 99 percent” was touted by many of the groups worldwide during their protests. According to the New York Post, Occupy movement protests in 18 cities across America cost taxpayers a total of $13 million. The protests popularized the slogan “99 percent,” as a criticism of the perceived economic inequality in America. The protesters issued a “Declaration of Occupation,” which was described as “more a world view than a list of demands” bemoaning corporate influence and “economic power” in American democracy. The declaration contained a wide-ranging list of left-of-center “grievances” blaming business influence for most of society’s ills. It complained that corporations had perpetuated sexist, racial, and gender-based discriminatory policies. The list also bemoaned policies opposing government-mandated health insurance and labor union privileges, and supporting domestic energy production. The list of grievances also touted a number of left-wing corporate food production, public welfare, and military-based conspiracy theories. OWS was criticized for lacking a set of core objectives that would allow it to turn its activists’ wide-ranging left-wing complaints into actionable legislative items or a sustained political upheaval. OWS co-creator Micah White continues to operate the website OccupyWallStreet.org, which was created by White and his colleague Kalle Lasn for Adbusters in the lead up to the protest. The website is currently operated by The Occupy Solidarity Network, Inc. (OSN) a group which claims to be a New York 501(c)(4) non-profit. White continues to use the website to push for new, leftist movements, in July 2016 he used the website to support #OccupyDNC, a Democratic National Convention walkout protest in support of presidential candidate Bernie Sanders against the eventual Democratic nominee Hillary Clinton. White uses the website to support the activities of the Black Lives Matter movement and what he labels “Occupy Black Lives.” However, White urges the Black Lives Matter protesters to learn from the failures of OWS to channel their disruptive actions into political activity that will put in place left-of-center leaders in government. The OWS website has an “action” link that connects (through a secondary source) interested activists with a wide array of left-leaning protest organizations, and which provides activists with other resources to carry out protest actions in their communities. The OWS website also includes a statement in support of safe occupy spaces for women and LGBT protesters co-signed by more than 50 far-left groups. The statement proclaims, “It’s no secret that the Wall Street 1% who wrecked our economy are disproportionately straight and male.” Among the organizations signing the statement with OccupyWallSt.org are organizations such as Radical Feminists, Code Pink, Tampa Anarchist Collective, and Occupy Patriarchy. However, OWS has been credited with helping to foment a variety of longer lasting left-leaning political organizations and movements, including a national May Day general strike, protests against a North Atlantic Treaty Organization (NATO) summit in Chicago, U.S. Senator Bernie Sanders’ presidential candidacy, protests by NFL players during the national anthem, and the Black Lives Matter movement. OWS activists formed a number of subsequent organizations focused on similar anti-corporate goals. OWS was supported by a number of radical leftist groups, labor unions, liberal celebrities, and Democratic politicians. At least some of OWS individual protesters were members of left-wing extremist groups such as Antifa. The leftist organization U.S. Day of Rage was an early supporter of OWS and helped to promote and plan the occupation protest. International fugitive Julian Assange was an enthusiastic early supporter of the Occupy movement, and in October 2011 he personally addressed an Occupy protest in London, England. Assange subsequently and apparently falsely claimed credit for planning the Arab spring and OWS protests. OWS was supported by many large labor unions. The United Federation of Teachers (UFT) and the Transport Workers Union (TWU) Local 100 pledged “solidarity” with the protest. The United Steelworkers and the International Brotherhood of Teamsters (IBT) union supported the effort. A number of other unions including the United Auto Workers (UAW), United Healthcare Workers (UHW) and Public Employees Union (PEU) District Council 37 participated in an OWS-organized protest march. Similarly, “Liberal groups such as MoveOn.org and Democracy for America gave their blessings” to the OWS protest and raised money to support the initiative. Numerous liberal celebrities, including Susan Sarandon, Michael Moore, Cornel West attended the OWS protests and spoke to OWS protesters. Similarly, left-wing academic Noam Chomsky announced his support for OWS. A number of major Democratic politicians expressed their support for the principles embodied by the OWS protest. President Barack Obama issued a statement that said the OWS protesters embodied “a broad based frustration” against corporate America, which was interpreted as a statement of support for the protest. U.S. Senator Bernie Sanders issued a “full-throated” statement of support for the movement saying, “We have the crooks on Wall Street […] and we will be damned if we’re going to see a handful of robber barons control the future of this country.” The then-co-chairs of the Congressional Progressive Caucus issued a statement celebrating the OWS protest, and a number of other Democratic members of Congress including, Reps. Keith Ellison (D-Minnestota), Raul Grijalva (D-Arizona), Barbara Lee (D-California), and Dennis Kucinich (D-Ohio) also issued statements in support of the protests. In total OWS raised just over $700,000 during a six month-period ending January 2012. By January 2012 the protest had only $170,000 left, voted to cease funding for any new projects and was expected to “go broke” by March 2012. OWS received financial support from a number of prominent leftists, including hundreds of thousands raised by the owners of Ben and Jerry’s Ice Cream, former Nirvana manager Danny Goldberg, television producer and People for the American Way founder Norman Lear, and millionaire Terri Gardner. The controversial leftist organization, Alliance for Global Justice, accepted tax-deductible contributions on behalf of OWS and managed OWS’s finances. The union-owned Amalgamated Bank held OWS’s funds.